Reedy Lagoon Corporation Ltd (ASX:RLC) has this morning released its quarterly report for the quarter ending 30 June, 2018. During the quarter RLC staked new claims to form the Clayton Valley project for lithium brine; completed drill-hole MBD-01 at the Big Smoky South testing a lithium brine target; identified lithium clay minerals identified in core from the holes drilled at each of Columbus Salt Marsh and Big Smoky South projects; and raised A$754,210 under an Entitlement Offer of options. 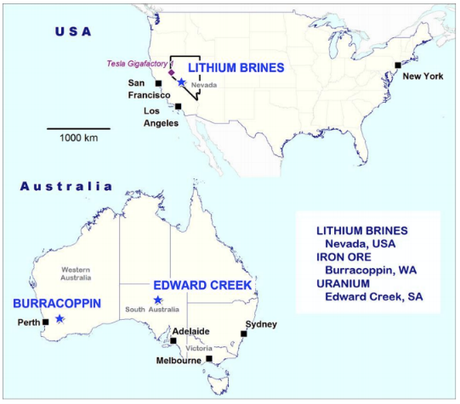 The location of RLC’s projects in Australia and the US. The Nevada lithium brine projects comprise four projects: Columbus Salt Marsh, Big Smoky South, Clayton Valley and Alkali Lake North. The projects are located in three large and separate ground water catchment areas in Nevada, USA. The projects are all within 50km of the Silver Peak Lithium brine operation owned by Albemarle Corp which is located 360km by road (US-95 route) from the Tesla Gigafactory (Lithium-ion batteries) in Reno. 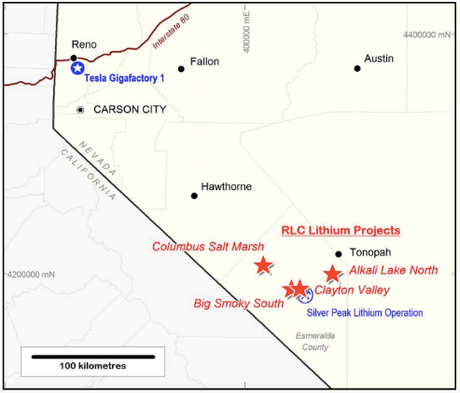 RLC’s lithium projects in Nevada, US. 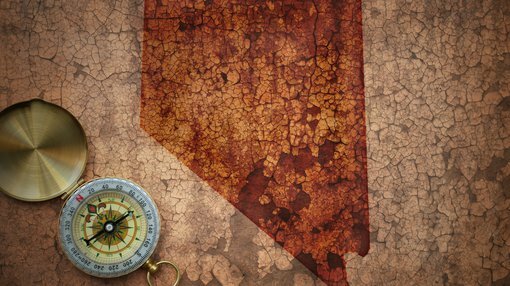 Size and claims for RLC’s lithium brine projects in Nevada. RLC staked 112 additional placer claims over an area of 906 hectares to form the Clayton Valley project in the northern part of Clayton Valley, Nevada, USA. The company entered into a contract for a 3-dimensional audio magnetotelluric (3D AMT) survey to identify conductivity anomalies indicative of brines. Drill hole CBD-01 was completed on reaching target depth at 1,000 metres. Six significant zones of volcanic ash and tuff were identified in the core samples recovered in drill hole CBD-01. Aquifers within these zones were believed by the company to be the most favourable zones within which to find dissolved lithium. Aquifers within these six zones were pump tested and brine samples were collected for assay. While the brines tested have high conductivity the maximum lithium concentration detected was 10 mg/L. This level is not considered by to be high enough to indicate potential for economic recovery of lithium. In addition to the six zones pump tested, all of which are at depths greater than 400 metres, a thick tuff unit between 146 metres and 167 metres was also considered significant. However, core recovery over the interval was poor and the ground was broken. These ground conditions made it inadvisable to take a water sample and conduct a pump test and for this reason no sample was taken from this aquifer. Drill hole MBD-01 was terminated at a depth of 401 metres after intersecting a thick sequence of lake sediments which the company interpreted as being beneath the geological horizons that are prospective for lithium bearing brines. Pump testing and sampling of four selected zones was attempted in MDB-01, including in a zone of volcanic ash layers intersected between 59 and 100 metres down hole depth from surface. However, fluid flow rates were too low to allow effective sampling. Lithium clay minerals were detected by analysis of hyperspectral data from drill core scans of the core from MBD-01. Selected sections of core will be assayed to determine the amount of lithium present. During the quarter, RLC entered into a contract for a 3-dimensional audio magnetotelluric (3D AMT) survey to identify conductivity anomalies indicative of brines. At 30 June 2018, RLC had A$1.2 million in bank accounts and deposits. During the quarter shareholders subscribed A$754,210 (37,710,515 options) under an Entitlement Offer of options. The issue price was 2 cents per option. The options expire on 6 April 2021 and each option gives the holder the right to subscribe for 1 new share in RLC by paying the 8 cent exercise price at any time before the expiry date.